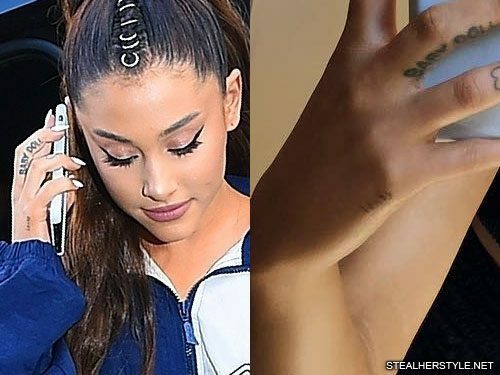 Ariana Grande got a “lumos” tattoo on the side of her hand in May 2018. In the Harry Potter universe “lumos” is the charm for creating light in the dark. 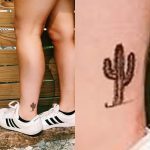 This tattoo has many personal meanings for Ariana relating to her music, her life, and her relationship — all of which are deeply entwined. 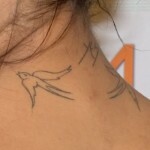 Her new album Sweetener has lots of references to brighter times ahead including the song “the light is coming.” Her tattoo also relates to a huge Dumbledore quote that Pete has on his forearm saying “Happiness can be found / Even in the darkest of times / If one only remembers to / Turn on the light.” So the lumos spell, turning on the light, is the key to inviting happiness into her life. 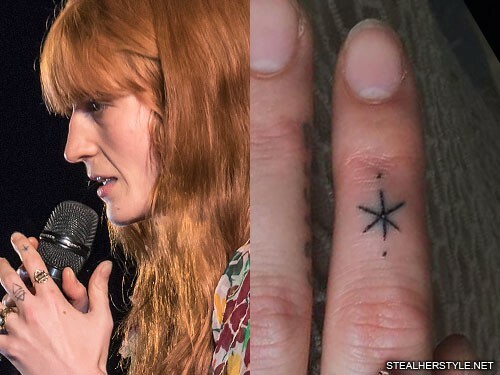 On her index finger is the alchemy symbol for the planet Jupiter (♃), which is associated with thinking and learning. We have not been able to identify the other symbols, which may be custom designs. Magical sigils can be created by combining the letters into a unique design. 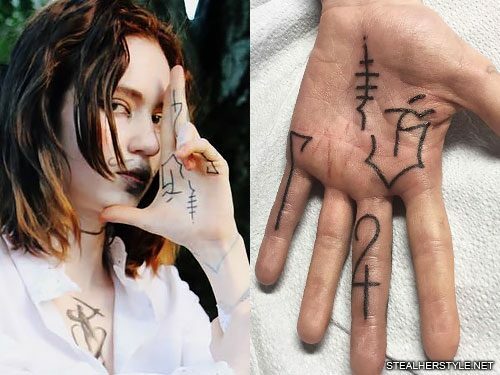 The lines at the center of her palm bear some resemblance to the letter E in the old Irish Ogham alphabet, but it doesn’t have the same bend at the bottom. Sia has a green ink tattoo on her right index finger which says “RADGICAL™”. She included the trademark symbol because she made up the word, which is a combination of rad and magical. 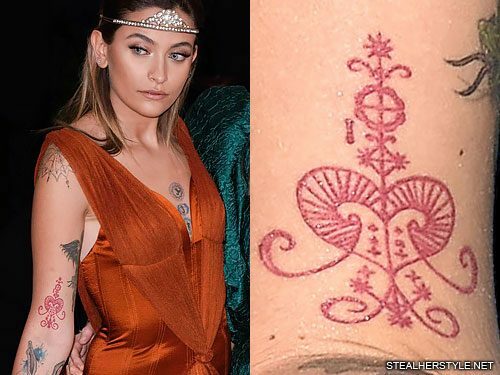 This red henna-like design on Paris Jackson’s upper right arm is actually a Voduo symbol. Each spirit in Haitian Voduo, called a “loa” or “lwa,” has its own “veve” which is a drawing that is traced out on floor using powder during a ritual. 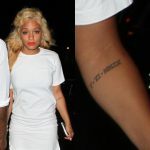 Paris’ tattoo is the veve image for Erzulie, who is the goddess of love. This loa’s symbols are a heart, a mirror and a fan, and all three of those images can be seen in the veve design in subtle ways. 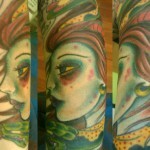 Erzulie is a personification of feminine grace and beauty and is seen as the most human-like of the loas. Haitian Voduo and other Afro-American Voodoo religions originated from West African Vodun. As practitioners of Vodun were brought over to the Americas as slaves, their practices evolved into religions that are unique to the areas they inhabited, where the traditions of West African Vodun were blended with other local influences — including Roman Catholicism. The Haitian interpretation of Erzulie Freda takes some inspiration from the Roman Catholic devotion Our Lady of Sorrows, iconography of the Virgin Mary as a suffering mother. Erzulie has a deep sadness in her and is often pictured crying.